We would like to ask you what does "happiness" mean for you! The answer is simple! Happiness is to see your lovely dog healthy. Happiness is to know that your dog doesn’t feel any discomfort. So, our masters try to take care of your happiness and happiness of your dog. That’s why they have created this Super Durable And Extra Comfortable Dog Collar for your lovely Amstaff. Its main goal is to bring maximum comfort to your dog with a help of a special inside soft felt padding. Due to it the collar is very agreeable and doesn’t rub or irritate the dog’s skin. Buy this excellent collar for your Amstaff dog and you will not worry about his unpleasant feelings! Be sure, he will be out of danger while performing different activities. 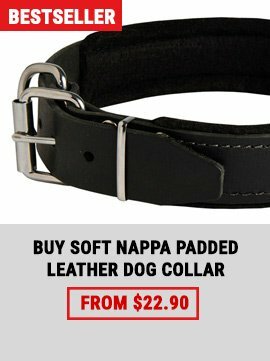 Why you should purchase this dog collar for your Amstaff dog? It is made of extra strong non-toxic 100% full grain genuine leather. 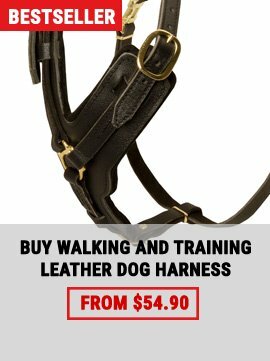 It means that it is a high-quality dog supply that will not bother your dog while active training sessions and safe walking. This leather is very soft and pleasant to the touch. That’s why, it doesn’t irritate or rub the dog’s skin. The collar is very comfortable for the dog wearing. It has inside soft felt padding which protects your dog from pain, that may be caused when excited dog pulls hard. The hardware, such as a buckle and a special D-ring for leash attachment is rust resistant. It will surely have the shining look through many years. 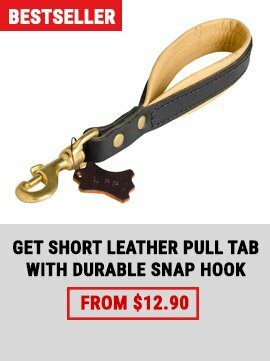 You can easily fix the collar on the dog’s neck with a help of the steel nickel plated buckle. 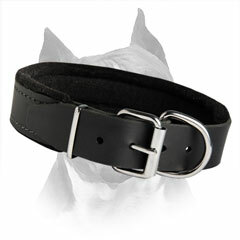 Be sure, this buckle is very durable and it is impossible for the dog to take the collar off. Never put the collar on your dog if it is of a wrong size. Be careful with a steel nickel plated hardware. In case of damage it can rust.